A bold new look with a muscular new grille is one of the first things that Ford F-150 truck lovers in the Schaumburg, IL, and Chicago, IL areas will notice about the 2018 Ford F-150 Truck series scheduled to arrive this fall. But there will be more engine alternatives, too, all paired with a 10-speed transmission that promises to deliver improved acceleration and performance. The all-new standard 3.3-liter Ti-VCT V6 engine will deliver 290 horsepower and 265 lb.-ft. of torque. Or you can opt for a 2.7-liter EcoBoost® engine that gets 325 horsepower and 400 lb.-ft. of torque, a 5.0-liter Ti-VCT V8 engine that gets 395 horsepower and 400 lb.-ft. of torque, or a 3.5-liter EcoBoost engine that is capable of producing 375 horsepower and 470 lb.-ft. of torque. 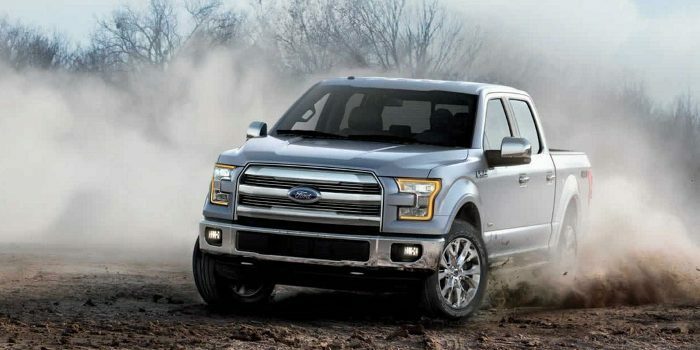 If you need even more power than that, go for the High-output 3.5-liter EcoBoost engine on the Ford F-150 Raptor model, which gets up to 450 horsepower and 510 lb.-ft. of torque. And for the first time ever, a new 3.0-liter Power Stroke® Diesel engine will be available in Spring of 2018. Auto Start-Stop Technology will be standard across the entire Ford F-150 lineup, helping to reduce fuel consumption and vehicle emissions while driving in the city. If you come to a stop and the truck is idle, the engine will shut off automatically to save fuel. When you take your foot off the brake and step on the accelerator, your smart energy-saving vehicle with intelligent idling will immediately start again, with no effort from you! The cargo bed on 2018 Ford F-150 trucks will impress as well. Available LED box lights can be added to make it easy for you to work in even the darkest locations, and side mirror-mounted spotlights can light up the night. Towing capacity will be amazing, utilizing power that was once found only in three-quarter-ton trucks. Dynamic Hitch Assist comes standard, providing a sight line on the instrument panel display so that you can perfectly align your hitch ball to the trailer receiver. Roesch Ford, conveniently located at 333 West Grand Avenue in Bensenville, IL, will be anxiously waiting for this amazing new line of trucks. In the meantime, if you’re looking for local cars for sale, we’ll be happy to help you now!